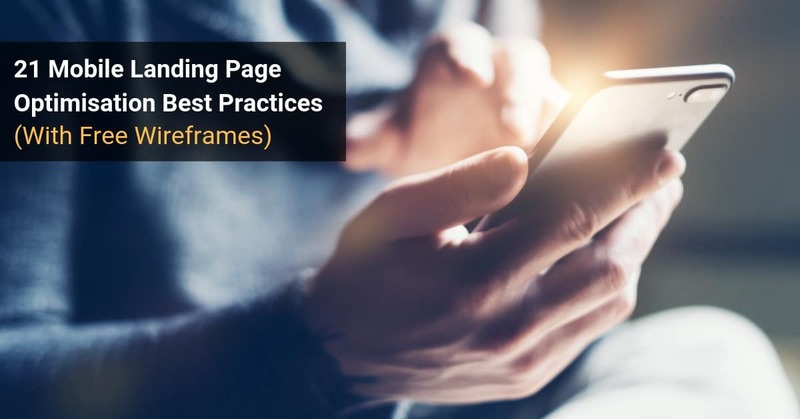 What’s the best way to optimise mobile landing pages like a boss in 2019? Most marketers used to treat mobile traffic as an afterthought… but those days are long gone. Even though mobile traffic may account for more than half of your total visitors, optimising your website for mobile visitors rarely gets enough attention. So if you’re looking for ways to convert mobile visitors into paying customers, you’ll love this post. I’m going to share 21 best practices to help you generate more leads from mobile visitors. In 2014, mobile accounted for 34% of Google searches. Check out how visitor device usage has increased for these two Marketing Results clients. You already know first impressions are important. And there’s nowhere more important than the “above the fold” area on your homepage. According to eye-tracking studies by Jakob Nielsen, visitors spend 80% of their time above the fold. Above the fold is the area that is most likely to get read. Also, the most likely to grab the user’s attention. 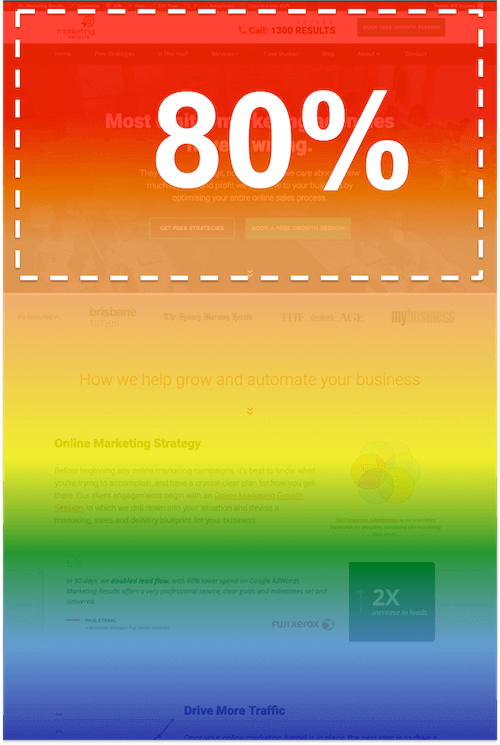 In fact, an eye-tracking study by Jakob Nielsen suggested that up to 80% of visitor time is spent above the fold. That’s why simply optimising your User Experience (UX) above the fold can be so impactful. 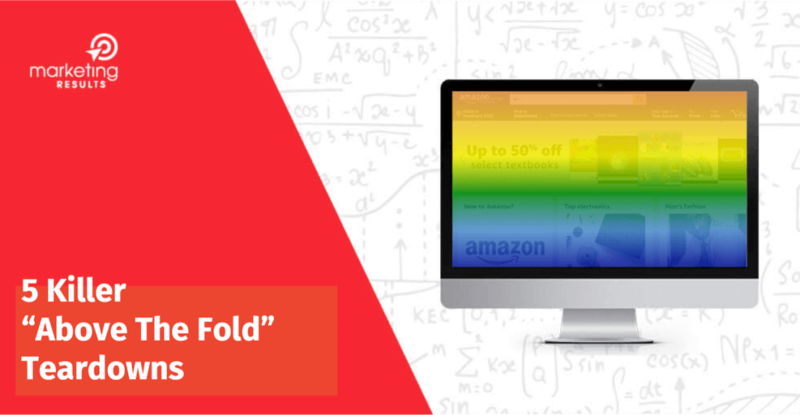 In this article we’ll look at some above the fold website examples from some recent projects, plus share the underlying principles you can use to optimise this super-valuable real estate on your own site. If you struggle to come up with compelling answers to any of these questions, chances are you’re leaking customers… and sitting on a golden opportunity. In this video, Digital Strategist Ben Sweetlove explains his process for identifying and improving the effectiveness of a multi-step lead generation funnel. If you’re responsible for lead generation in your organisation (or you’re the one paying for Facebook or Google Ads), this video is for you. Ben: Hi there guys, it’s Ben here. Now, in this quick session, I’m going to talk about the growth hacking process or the process I follow when I want to improve the performance of a lead attraction and nurturing funnel. 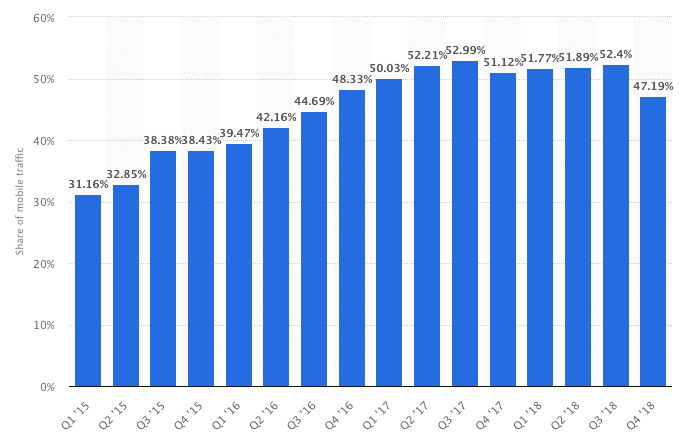 So if you’re using Facebook advertising or Google Ads, formerly Google Adwords, to send traffic through to a landing page then this will hopefully provide value to you. So this is the process that I go through with most of our new clients if they are advertising already when they come on board, just to make sure that they’re getting the best performance from their advertising budget. I know you’re probably busy, so I’ll get right into it. If you’re spending money on Facebook or Google (or any paid traffic platform, for that matter) to generate leads, let me explain an in-depth process to make sure your campaign doesn’t end up in an early grave. Before we begin, let’s clarify a few key things you need to consider when planning your lead generation campaign. An effective lead generation campaign will create ALL of the above situations, via ad creative and landing pages. With all the rapid changes in digital commerce, coupled with the customer acquisition success stories you may have seen, it’s easy to get excited by the potential of digital marketing in your business. But for several years I’ve observed the pattern where digital marketing efforts start with a hiss and a roar, before running out of steam as you and your team get busy and and preoccupied with day to day operations. So let’s talk about two Digital Marketing Implementation Frameworks for ensuring your digital marketing gets done on a steady and consistent basis, all year round. These are frameworks we deploy at Marketing Results for clients – but the concepts are equally applicable to an in-house team, or remote team. Framework #1 is the Expert Team model – because digital marketing is a team sport. The same brain that is great at formulating digital strategy is not the same brain that is likely to be a gun at writing direct response copy, conversion-oriented design, split-testing landing pages, implementing marketing automation systems or managing Google AdWords. Yes, it’s possible to have a “generalist” who can do a little bit if everything, but they tend to be very strong in 1 or 2 areas, average at many things, and very weak in a few areas. So you end up with an inconsistent result. Ben: Hi there guys, it’s Ben here. Now in this session, I’m going to talk about the top 10 strategies used by our most successful digital marketing clients. In other words, I’m going to talk about the success formulas, or the success patterns that we’ve noticed over time, that our most successful clients are using, that are getting the best results for them. Now this is based on working with hundreds of clients in dozens of industries over about 15 years, so there’s a fair bit of data that’s gone into producing these top 10 strategies. How important is website traffic to your business? If you rely on web traffic to generate leads and grow your business, then SEO needs to be on your radar. Paid ads are a great way to generate quick wins, but if you can optimise your site for search engines it’s like the gift that keeps on giving. The traffic comes in day after day even when you’re not doing anything extra, OR paying for it. Given the age of the internet and the considerable amount of websites competing for the same search engine traffic, SEO is much harder than it used to be. Especially when it comes to ranking for competitive keywords in your industry. But if you CAN rank for competitive keywords, your business offer can get in front of your target market consistently and sustainably. So how do you rank for competitive keywords? The problem is that there are established brands with HUGE marketing budgets that already have the top spots filled, and they aren’t going to give them up without a fight. Sure they might own the real estate for now, but using the proper strategy and tools can help you beat the competition. Let’s take a closer look at how. Start your SEO journey by creating a list of potential keywords you would like to get search engine traffic for. Have you ever considered the best way to organise your digital marketing function? Or perhaps you’re preparing for a growth phase, and it’s time to make some choices about how you resource your efforts? Deciding whether you hire a full-time digital marketing team or outsource to an agency can be challenging. There are lots of things to consider, many of which are hidden from plain view. Especially if you’ve never been through it before. That’s why we decided to put together this comparison for you. The rest of this post will help you make an informed decision about what the best path for you and your business is, by clearly outlining the Pros, Cons and Tie-Breaks when it comes to hiring a full-time digital marketing employee or outsourcing to an agency. Full disclaimer up front: at Marketing Results we’re positioned as a “Full Time Digital Marketing Employee Replacement”. But I’m not here to sway your opinion either way – we recognise there’s a case both ways, depending on your situation. If you hire a full-time team member for your business, they can immerse in your culture and values 24/7. Your brand has a unique history, vision and goals that you’ll need to explain clearly to an outsourced team if they’re going to help convey it in your marketing message. 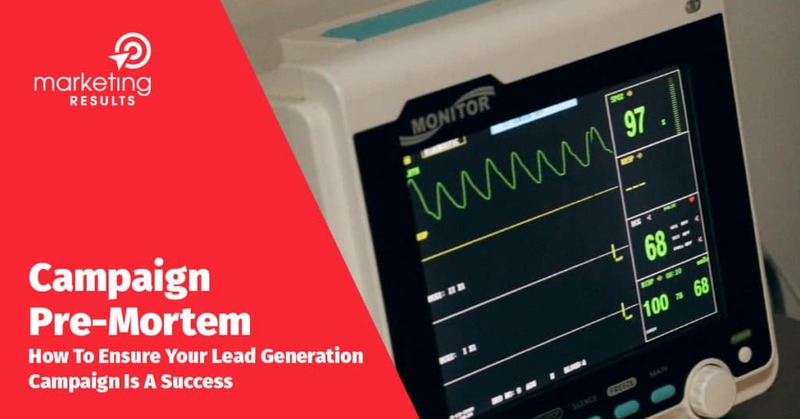 What’s the ideal lead management dashboard for keeping track of lead generation and sales activity? Since 2003, our focus has been on lead generation – but it didn’t take long before the realisation hit that nothing happens until a sale is made. All the leads in the world mean nothing until they convert into new cash, customers and profits. And because we work remotely from our clients, to really see what’s happening on the coalface, we’ve needed to develop complete lead and sales management systems that provide full visibility of the entire revenue generation function. And there are 5 functions to this system you need to have in place in order to continuously improve results. A lead generation function: marketing campaigns that draw qualified prospects to you on a steady and consistent basis. A lead management function: a process for effectively managing the leads you get and plugging them into your sales process. You need to ensure unqualified leads don’t unnecessarily consume your salespeople’s time – and also that good leads don’t get dropped. A sales process: a series of defined stages that prospects go through in order to become your client. Sales scripts: structured language designed to achieve the best sales outcomes (without appearing “wooden” or unnatural). A sales management function: this includes the visibility you need to monitor what you’re getting, warn you when things are off track, and report on outcomes and progress.